Burton is a sweet, gentle dog looking for his forever home. Please read on about this special boy! Burton was a stray in Texas, and made his way to a local Texas rescue and was living in one of their foster homes. Once Hurricane Harvey hit, the rescue reached out, wanting to move some of their current dogs so they would be able to take some of the Houston dogs displaced by the storm. 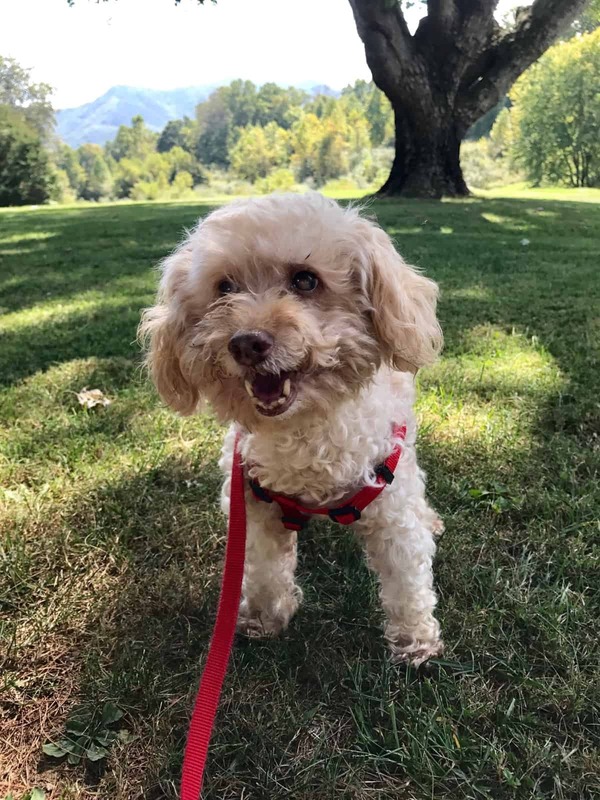 The Blind Dog Rescue stepped up to take Burton, and he traveled to Virginia in September 2017 to his Blind Dog Rescue foster home. Burton is an apricot poodle and he weighs about 11 pounds. He is thought to be about 9-10 years old. His coat is thick and beautiful, and, soon after arriving, he went to the groomers to get a trim, and the groomer said he was so well-behaved! Burt also had a dental, and seven teeth needed to be removed. Some bone loss and some abnormality of the extracted teeth were noted by the vet. Now he has a bright white smile and no more mouth pain! Burt also had bilateral ear infections, but his ears have had a deep cleaning and also have been treated, and they are fine now too. He had a small cyst (benign) on his front paw that was removed during his dental. He has a heart murmur – grade 3 out of 6. He does not need medication for the heart murmur at this time, and may not ever need medication or any special care. Sometimes he has a cough, and the vet has not determined a particular cause. An x-ray was done, and minor thickening of the bronchioles was noted but the lungs and heart looked okay. He is heartworm negative. Burt had advanced cataracts in both eyes, and then the left eye developed hyphema (pooling of blood in the eyeball) with no certain cause. After attempts at treatment were made, the left eye was removed on November 10th. He still has his right eye, with cataracts, lens luxation, mild uveitis, and no response to light. He has very little, if any, vision. Right now he is on a once-daily drop in his right eye for the uveitis. Burt also has very, very limited hearing. But not being able to see or hear does not prevent Burt from being sweet and gentle. When he was at the vet for the day for his dental, the staff said he was happiest when he was in someone’s lap. At his Virginia foster home, he enjoys stretching out on the sofa by his foster mom, and likes to have his belly rubbed. Burton tends to sleep most of the time. Burt shares his foster home with four other dogs and a cat. He doesn’t seem interested in the dogs, although will share a bed with them, but he will bark and seems a bit agitated if near the cat, although most of the time does not seem to think about her. However, it would be best if Burton was not in a forever home with a cat. Burt has not growled or snapped at anyone, though, four-legged or two-legged. He is a gentle boy. Burton likes to eat and enjoys snacks, like pieces of banana and peanut butter. He gets soft food at his foster home which seems easier for him to eat. He sleeps quietly through the night but does not like a crate, and becomes very anxious and very loud when placed in one. He walks on a leash, slowly, but is not yet really interested in taking walks. He likes to go out to do his business, and then he stops walking and is ready to come back in. He is sort of housetrained. When taken outside, he always goes, but he will also pee in the house at random times, so always wears a belly band inside his foster home. He seems very hesitant with the steps, so should be in a forever home that does not require him to go up and down steps. He is very happy to be carried! Burton is looking for the just-right person or family to give him the love and attention he so deserves. We don’t know how Burt would be around young children as he has not had the chance to be with any yet, but all dogs should be closely supervised when with a young child, especially a dog like Burt with limited, if any, vision and hearing. While Burt waits for the perfect forever home, he is writing a blog about his adventures in his foster home, so check in often! The link for his blog is here. Burton was adopted on January 23, 2018. Burton is looking for his forever home. If you think it could be yours, read more about Adopting from BDRA before submitting your application below. 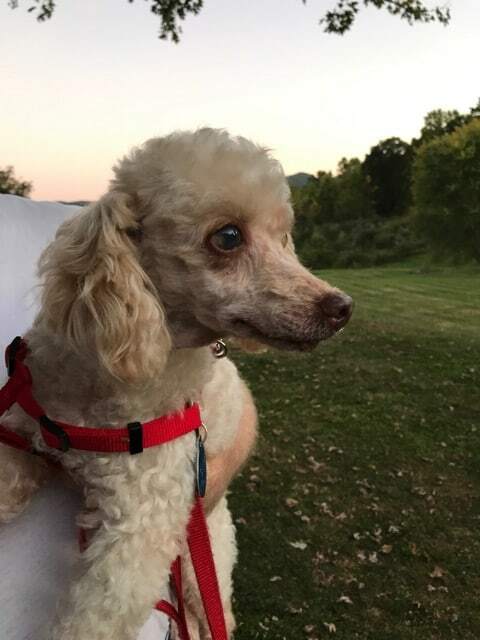 BDRA relies on your donations to rescue blind dogs around the United States. Please consider giving in support of Burton.